Reservoir operations in California typically follow specific rules to balance water demand, flood control, and other beneficial uses of water. Amid storms in early March, the Bureau of Reclamation began releasing water from Folsom Reservoir to prepare for potential floods. The dam is an important part of the Sacramento region’s water resources management system, providing water to people, fish and wildlife, hydroelectric power generation, flood protection, and salinity-control requirements in the Bay-Delta. Water releases have increased from the initial 8,000 cubic feet per second (cfs) to about 20,000 cfs to accommodate inflows from Sierra runoff. Additional releases may be required based on actual and forecasted inflows into the reservoir. Folsom reservoir’s strict storage level of 60% of capacity in winter months has drawn criticism as these releases present a water shortage risk if spring precipitation is deficient. Several groups are calling for the Bureau to develop new reservoir operation rules, which integrate weather forecasts to help determine when and how much water to release. Meanwhile, Senator Dianne Feinstein (D-Calif) is calling on the Bureau to increase pumping in the Sacramento-San Joaquin Delta, within bounds of the Biological Opinions, to capture water from recent storms and transport them to drought-stricken farms and cities in Central and Southern California. Subject to pumping restrictions under the Endangered Species Act, the federal agency determines water diversion activities in the Delta based on water quality, temperature, recent fish counts and location relative to the pumps, among other factors. A recent snow survey showed statewide snowpack at 83% of the March 1 average. 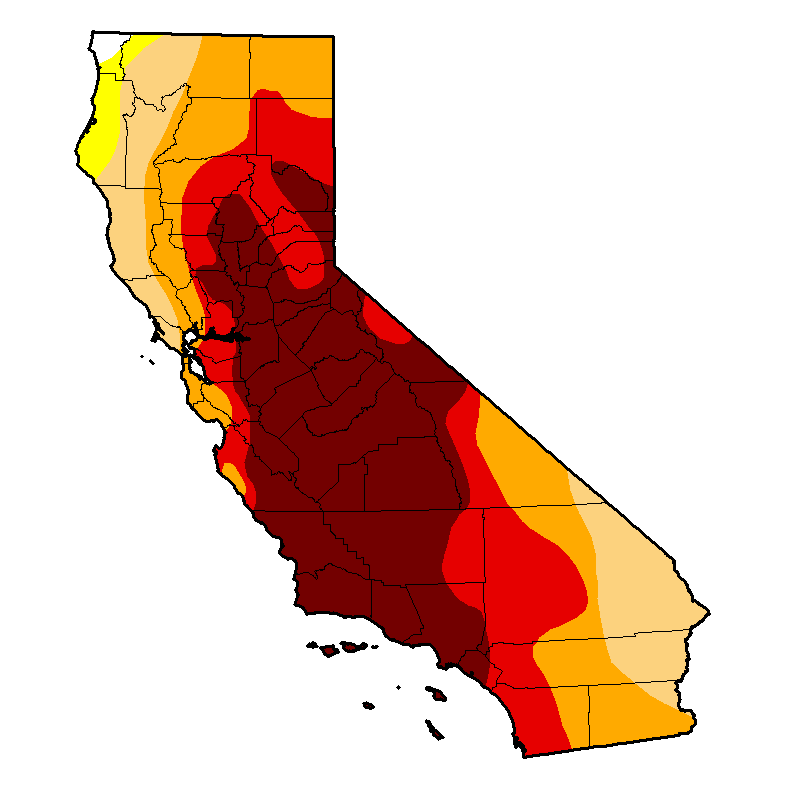 Unless California receives heavy rain as much as it did during the “March Miracles” of 1991 and 1995, drought conditions will persist for another year. The California and Oregon Departments of Fish and Wildlife estimated that the population of the autumn run Chinook salmon in the Klamath River is about a third of last year’s estimate and the second lowest predicted since 1996. The low prediction number is based on the combined effects of climate change and the ongoing California drought. Meanwhile, delta smelt count has hit the lowest level ever recorded for January and February. The board of the Metropolitan Water District of Southern California, the largest water wholesaler in the state, voted to enter into a contract to buy four islands, spanning 20,000 acres, in the Sacramento-San Joaquin Delta. The purchase would be in the range of $200 million. The islands will be converted into fish and wildlife habitat and some areas will provide access for the construction of the twin tunnels to convey water to southern California. This deal is being sharply criticized by some Delta farmers and environmental groups due to potential impacts on water quality, flood control, and wildlife habitat. A new study by NASA, Scripps Institution of Oceanography at UC San Diego, and other partners found that atmospheric river storms in California’s Sierra Nevada are 2.5 times more likely than other types of storms to accelerate the melting of snow, with warmer rain falling on snowpack and causing it to melt. LA County is using cloud seeding technology to increase the amount of rainfall from existing clouds. Under the right atmospheric conditions, the method can produce 10-15% more rainfall, according to a county estimate. The California Natural Resources Agency recently released a report, titled “Safeguarding California: Implementation Action Plans,” which aims to enhance the state’s readiness for future droughts and other climate change impacts. The plan outlines current adaption efforts and actions that will be taken by state agencies. A proposed ballot initiative to support the construction of new reservoirs and water storage projects in California has sparked a new debate on the state’s priorities. The ballot initiative would shift $8 billion from the high-speed rail project to a newly created agency, the State Water Storage and Groundwater Storage Facilities Authority. It would also shift $2.7 billion from the water bond approved in November 2014 to the new authority to improve water supplies. Drought conditions significantly improved over the last two weeks. Areas under exceptional and extreme drought conditions have shrunk to about 61% of the state. Storms had shifted southward, bringing rain to all of California except the southeastern tip of the state. 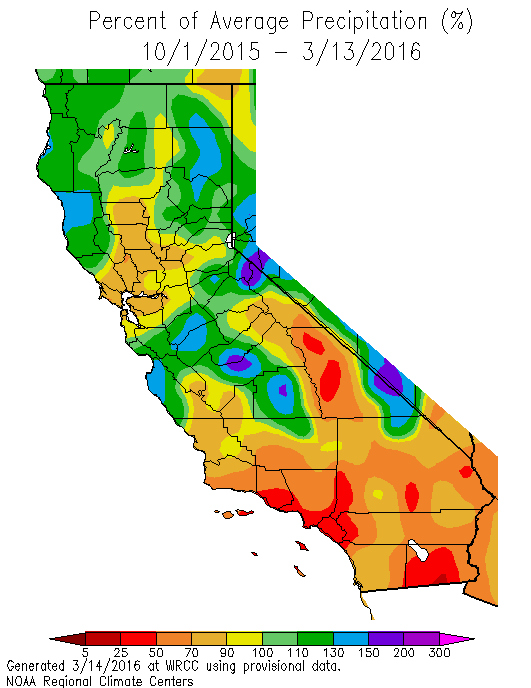 California experienced a rapid transition from record warmth and dryness in February to a very wet March. However, it is unclear what the remainder of the month will look like. Snow-water content is at 92% of normal for this date, as of March 15 (see these snowpack plots for changes over time). Cumulative precipitation in the Northern Sierra and San Joaquin regions is above long-term averages, while it is about average in the Tulare basin. 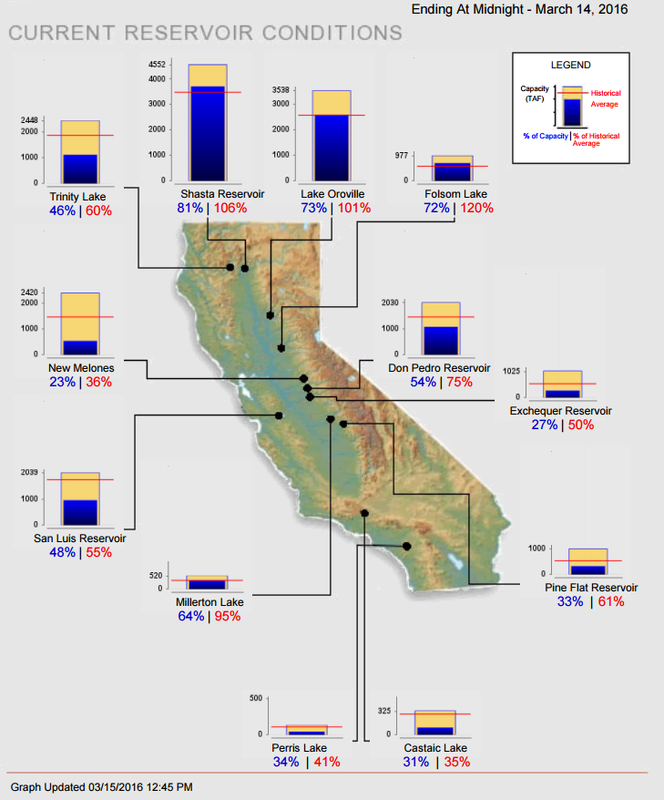 Water levels in California’s major reservoirs (representing 27.3 million acre-feet of storage) have significantly improved to 52% of statewide capacity, compared to 42% two weeks ago. Levels are considerably higher than last year, but represent only 81% of group average. Major reservoirs, such as Lake Oroville, Shasta, and Folsom, are now at 101%, 106%, and 120% of historical average, respectively. A new interactive tool, by KQED News, shows changes in reservoirs’ storage levels since January 2010. Click here to use this tool. 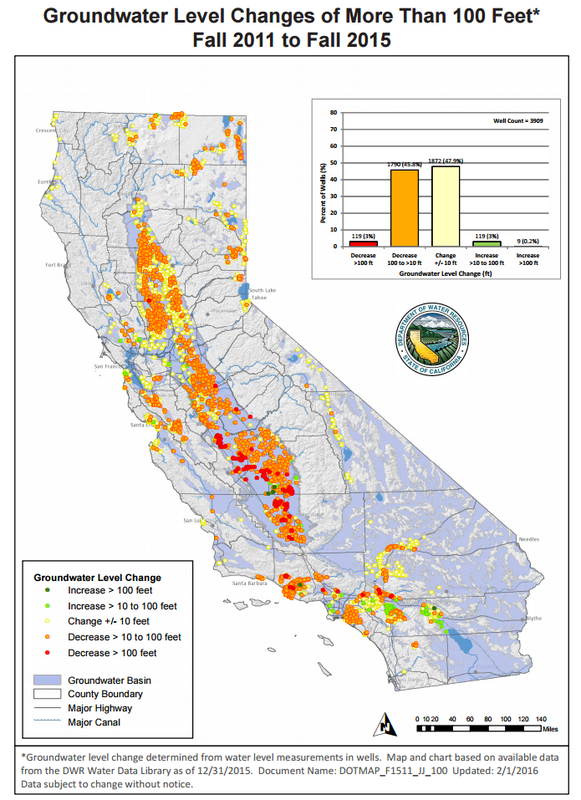 DWR recently published a map of groundwater level changes from fall 2011 to fall 2015. Areas with the greatest concern, i.e., those areas where groundwater levels have declined by more than 100 feet, can be found in parts of the Tulare Lake, South Coast, and Colorado River hydrologic regions. 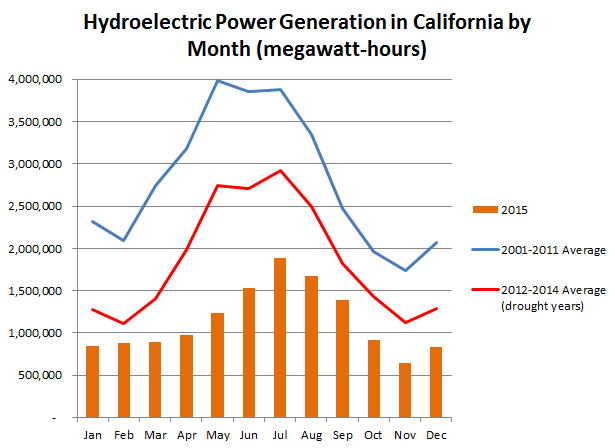 Hydropower generation in 2015 was about 13,700 GWh, 60% lower than the 2001-2011 average and 40% lower than the 2012-2014 drought-year average.